So… the recap… 141.5 hours in transit over 27 days has brought me 6,610 kilometers from the southern tip of India to Darjeeling. Back somewhere near Cochin, when I was outlining this little jaunt through India to Kathmandu I knew I was going to need to build in some time off… yes, time off from my time off. But moving around so much, especially in India, is tiring. So when I saw a chance to do a small trek near Darjeeling, I knew I had to build it into my schedule… it would get me out and about, give me a chance to warm-up for some planned long treks in Nepal and I wouldn’t have to spend to many hours sitting on a bus or train. 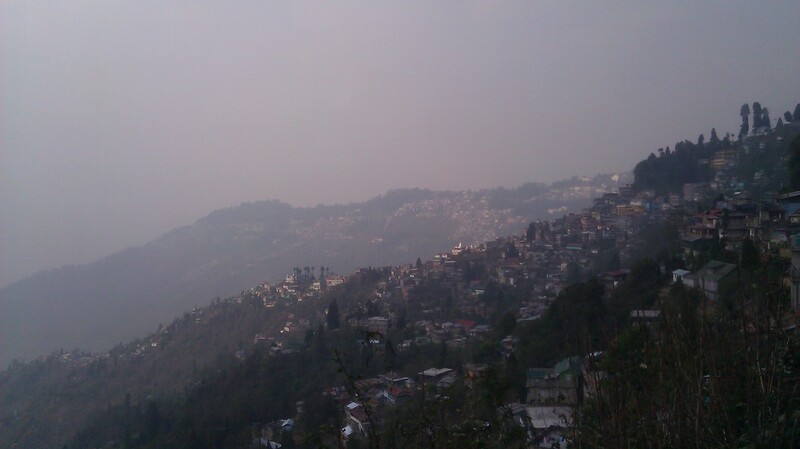 First though, I’d spend two nights in Darjeeling. Perhaps it be obvious if I had really looked at a map… so, for your benefit… here’s a map of Darjeeling… scroll out and you’ll notice some things. 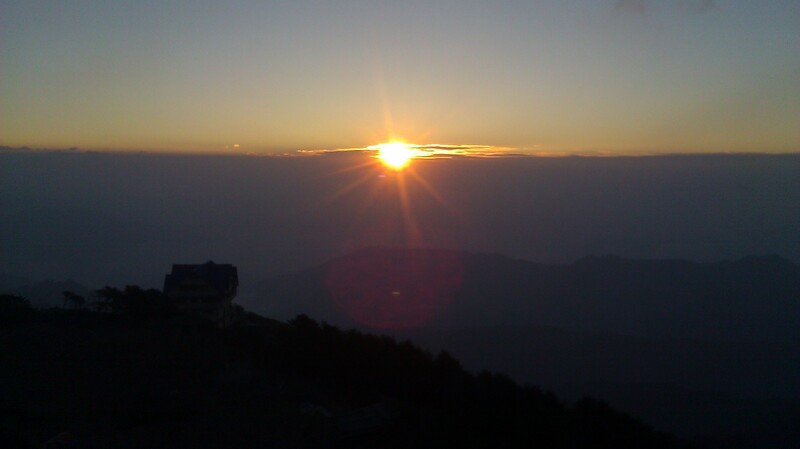 First, Darjeeling is east of Nepal. Second, Darjeeling is west of Bhutan… Now,as I’m sure you know, both Nepal and Bhutan are known as Himalayan kingdoms… because they’re in the Himalayas you see… So, being between them, places Darjeeling… wait for it… in the Himalayas. Which explains why it’s so cold, and also why the people don’t look like Indians (yes, technically they are Indians, but they look like Nepalese / Tibetans / Bhutanese / not Indians… and, as I found out later, they speak Nepalese and Tibetan more than they speak Hindi or Bengali). Darjeeling, upon arrival, is not set in rolling hills amongst tea estates like I thought it would be… the whole town sets astride a sharp mountain ridge, with sides that plunge nearly straight down, such that the town is literally built into the hillside, with streets winding up and down rather steeply and most things connected by long stairways (and I thought San Francisco was steep… also, as it turns out, the tea estates are all built into the steep hillsides as well). The town, the climate, the people… definitely not India (also, less trash and less animals). 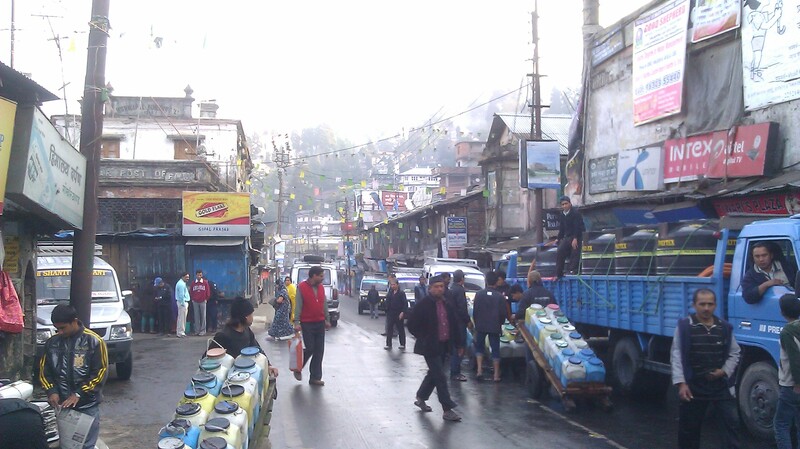 Darjeeling feels like what I imagine Nepal to be like (as I’ve never been… yet). 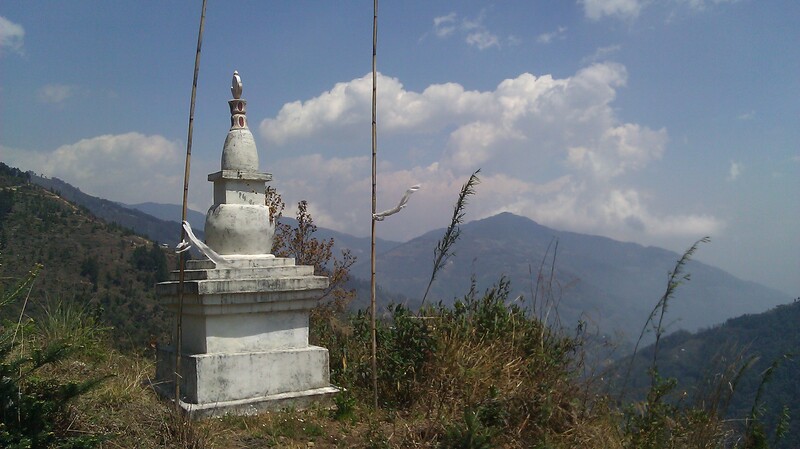 In speaking with a couple of locals, they agree… Darjeeling is in India, but definitely not Indian. 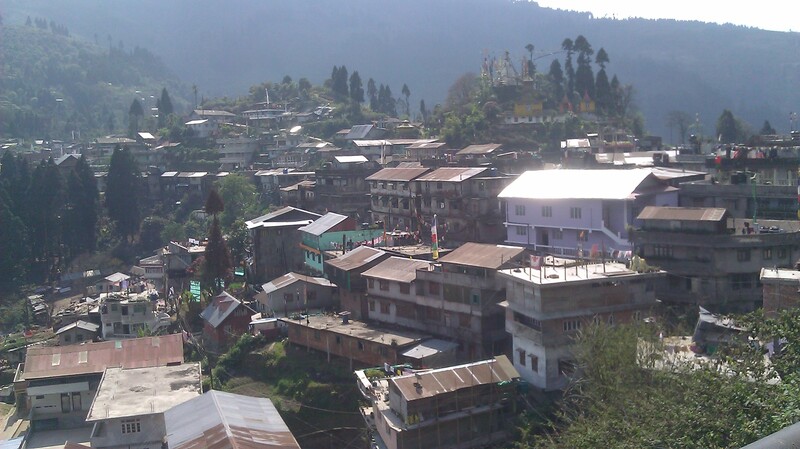 For me, it was a very nice change of pace… nice to be cold for the first time in a while, nice to walk around a relatively clean place, and nice to be around the much more laid back mountain vibe of Darjeelingians. 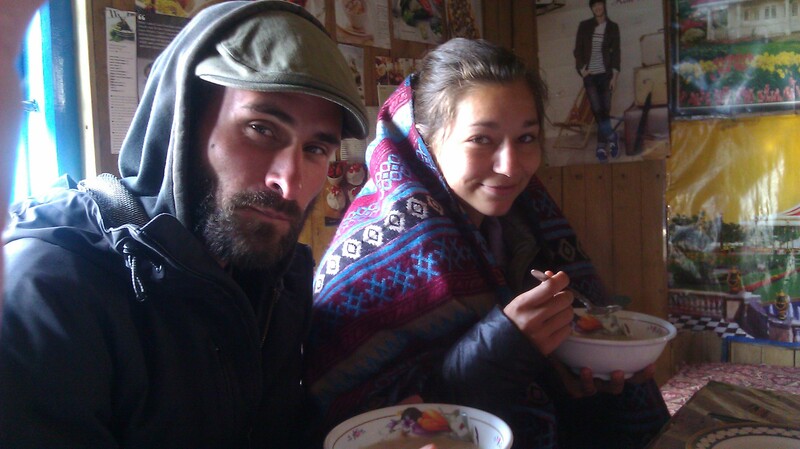 I spent both my nights hanging out with the American couple, hitting up some Tibetan/Nepali food places and both (yes… both) local pubs. The one day I had to myself I was planning on figuring out how this trek was going to work. However, fate intervened in the form of a french couple sitting next to me in a crowded breakfast place. We struck up a conversation and I found out that they were planning to do the trek same trek I was, and were planning to start the next day… same as me. And here’s where fortune really smiled, they had already been to the tourist office and figured the whole thing out… c’est bon (continuing on a long line of traveling on itineraries thought out by others… for the record here, Andalusia, Simien Mountains trek, Mombasa/Zanzibar, Kilimanjaro, Indian Wedding, Bangkok/Phi Phi Island and Kerala house boating… thank you planners). We all talked a bit more to make sure each other wasn’t crazy, and, after mutually deciding in the affirmative, we agreed to trek together and split costs. We had a bright and early wake up call the next day (we met at 6:15 AM) to jump on the first of two shared jeep rides to Maney Bhanjyang for the start of the trek. Now… you all know I like me some long walks (see here, here and here)… but why go trekking in India of all places? 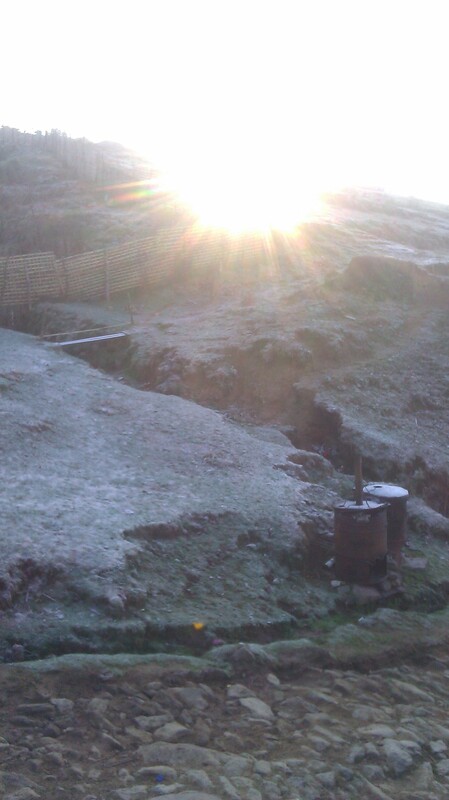 Well, just remember the above… Darjeeling is in the Himalayas. 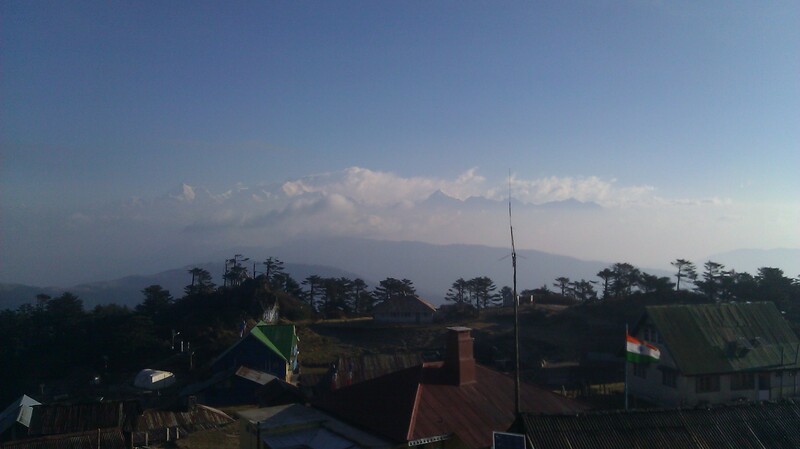 From the town itself, when it’s clear, you can look north at Kanchenjunga (the third highest mountain in the world). And… if you travel and hike a bit up to a certain mountain ridge (the Singalila Ridge), you can see both north to Kanchenjunga and east, into Nepal, where you can see Mt. Everest (and several other very high peaks). 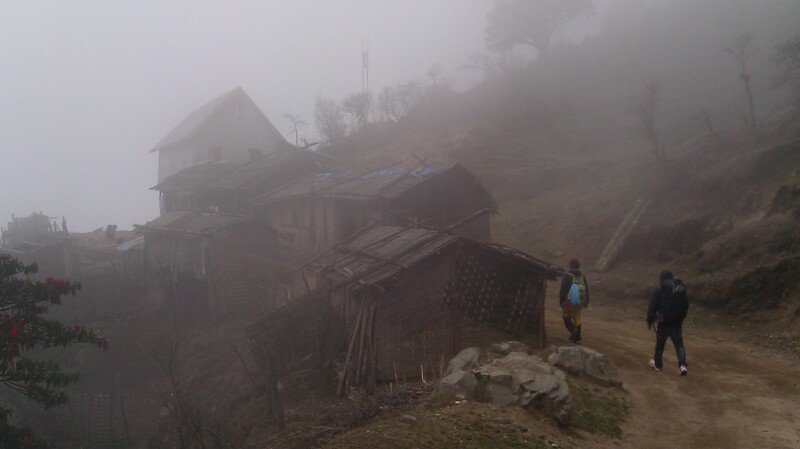 The trek itself is a firm fixture in the tourism circuit out this way, which is nice, because it’s popular enough to have become a “tea house” trek, whereby you really only need to bring clothes as there’s places to eat and sleep all along the route. All the frenchies and I had to do was make our way to Maney Bhanjyang, hire a guide (mandatory as the Singalila Ridge is in national park) and start walking, which is what we did (interesting note in guide hiring, there were two pricing options, one being 500 Rps per day, but with the catch that we had to pay all of the guide’s expenses, or the other being 800 Rps per day, and the guide would pay his own way… we chose the latter). 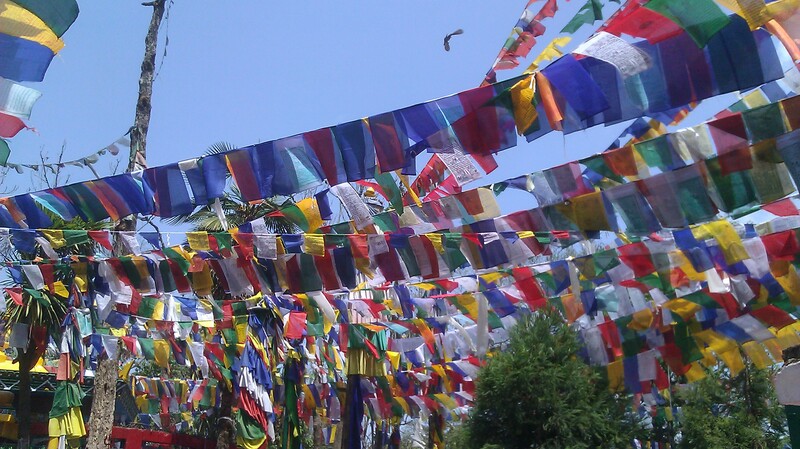 Just one more thing adding to the whole I’m-not-in-India-anymore feeling was our guides name… Tshering Sherpa. Day 1: 26-kilometer jeep ride from Darjeeling to Maney Bhanjyang followed by a 14 km walk from there to Tumling (2,130m to 2,980m), uphill in general (the first 2.5 kilometers being pretty much straight up), but with a couple of downs followed by more gradual longer ups. Day 2: 13 kilometers from Tumling to Bikay (2,980m to 3,200M in altitude), first half all down hill, second half all uphill with 2 kilometers of super steep switchbacks (we actually descended 250 meters to the halfway point before climbing up the, now, 500 meters in altitude to Bikay). 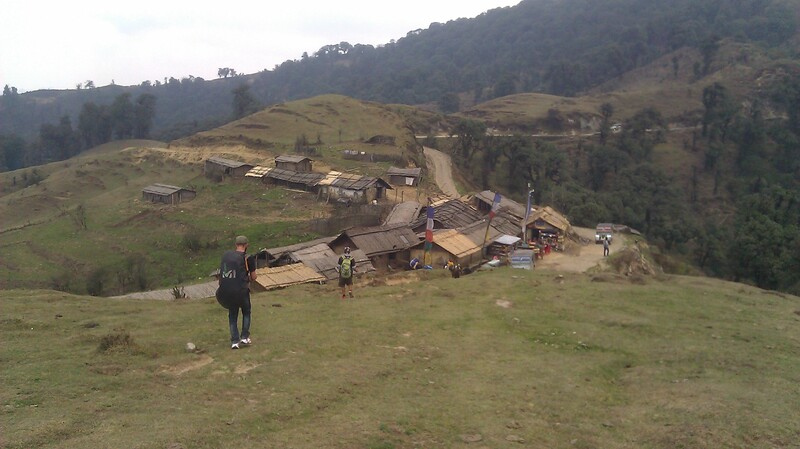 Day 3: 4 kilometers from Bikay to Sandakphu (3,200m to 3,640m)… pretty much straight uphill the whole way. Sandakphu is a peak (the hard version would have arrived here at the end of day 2, and then the trek across the ridge from here to the other peak at Phalut would be the third day). Day 4: Early rise for views of the surrounding mountains followed by a 15 kilometer descent to Srikhola (3,640m to 1,900m), all downhill, sometimes very steeply. Day 5: Easy 6 kilometer walk from Srikhola to Rimbik (1,900m to 2,290m) where would catch a shared jeep all the way back to Darjeeling (only 76 kms away, but a four hour drive nonetheless). All in all, 53 kilometers (33 miles) of walking with 4,140 meters (2.6 miles) of ascending / descending over 15 hours of walking time (a decidedly leisurely 3.5 kilometers per hour). 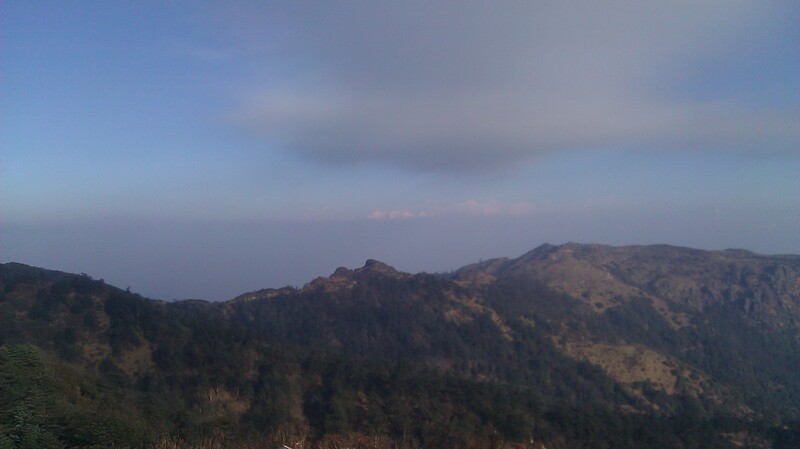 I have to say that the whole trek was very nice. Although, after about noon on day 1 until about noon on day 4, the weather was very cold… numb hands and feet at all times and sleeping under about four blankets cold. The folks up here really aren’t into heating… there’s cooking fires, but no other source of heat really… everyone just bundles up (I found this a bit odd and have no hypothetical explanation other than that maybe fuel is expensive here? )… so I was pretty damn cold for about three days straight (making me slightly re-adjust what I may need clothing-wise for Nepal). The route for this trek actually crosses into Nepal a few times, so I actually have now officially been to Nepal, even though I can’t prove it (there’s no passport control, but the Indian army has several border checkpoints where you have to register yourself). 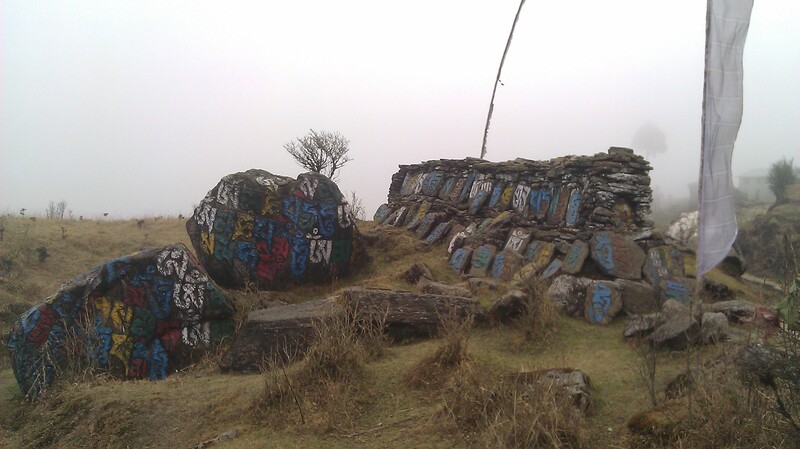 The scenery, when it could be seen (i.e. 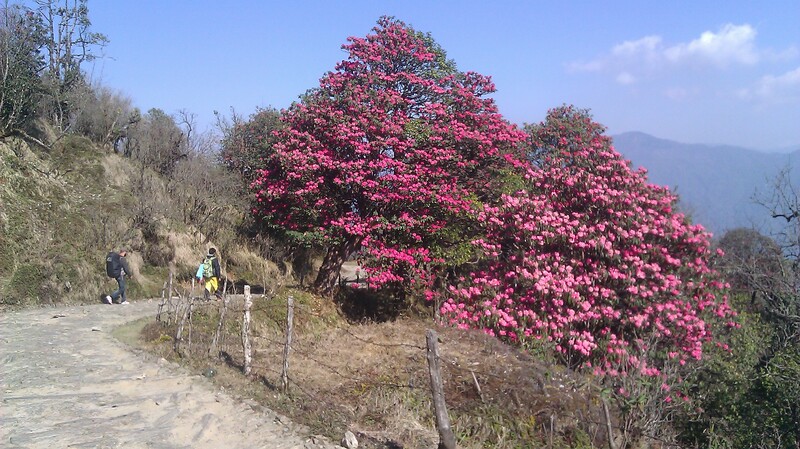 in the mornings before the fog rolled in) was beautiful… Big mountains, steep sides, deep valleys all dotted with little Himalayan villages and giant rhododendron trees (mostly in bloom with bright red flowers). The french couple turned out to be really cool… both 24, he an ex-french army guy that now makes charcuterie and she working on a degree in reflexology. It was the first time I’ve spent an extended period of time with French people (they both spoke passable English … nice to learn a little bit about France (note to Americans out there, most other Europeans dislike the French for various reasons… and as many don’t speak English very well, I haven’t interacted with many on my trip so far). I also met a dutch family (two dutch families to be precise, but they were in one large group) doing the same exact easy-version of the trek as we were. Interesting background, two men, both with two children each along, and one wife (no… they’re not sharing a wife, the other one, who is actually Sri Lankan, had elected to stay at home) who all live in Dubai. I had some interesting conversations with the parents about expat life in general and life in Dubai specifically and had some good fun playing monopoly and charades with kids (ages, 14, 12, 8 and 6 I believe for hours on end (there was really nothing to do once we reached the lodges, as it was freezing outside with no view). Very nice family… the oldest girl I think has already been to more countries than I have in my life up to this point… and all the kids spoke fluent English Dutch and passable Arabic… with intra-family conversations being held in multiple languages at the same time. It was fun to hang out with them for a bit and get some nice family-time since I haven’t seen my own family for almost a year (and yes… I do miss you). Post trek, we made our way back to Darjeeling via shared jeep, where I spent an extra day re-grouping (doing laundry, running errands, sending postcards, etc.) before beginning the last leg of my marathon journey to Kathmandu (two shared jeep rides from Darjeeling to the border where I’m to board a bus for a quick little 17-hour overnight bus ride from the border to Kathmandu .. planning to arrive on April 7th in time to meet my friend Ben for some trekking in Nepal. Very happy to have stopped and smelt the roses here for a bit… I think Darjeeling and this trek have given me a little taste of the road that lies ahead. 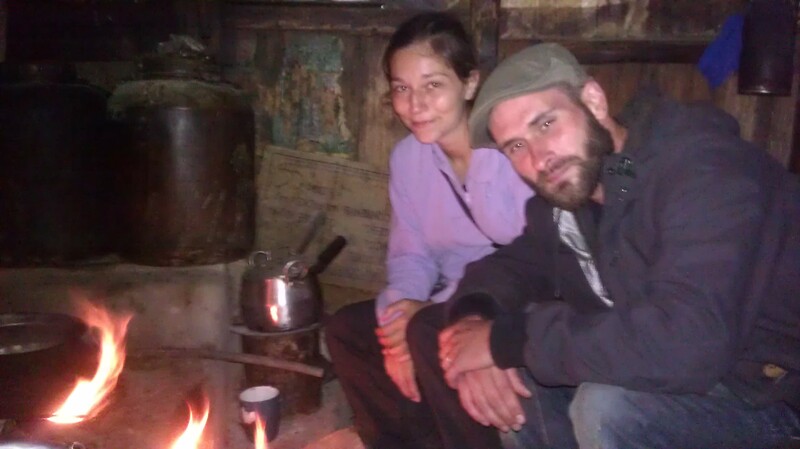 3/31: Shared Jeep rides from Darjeeling to Maney Bhanjyang: 1.5 hrs. 26 kms. 60 Rps. 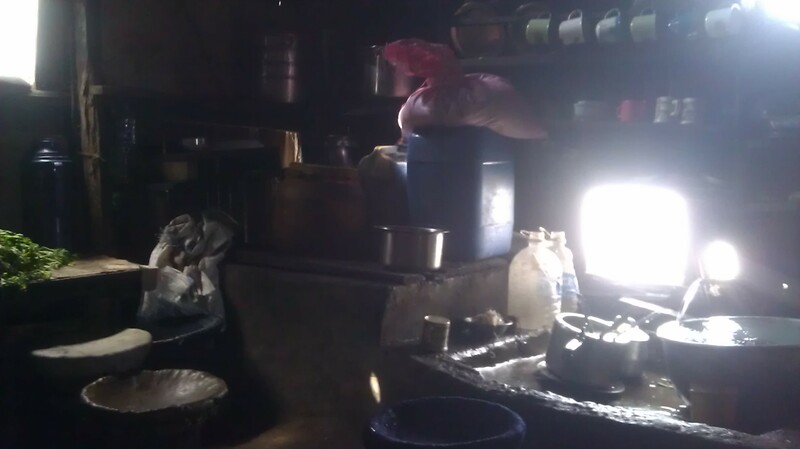 4/4: Shared jeep from Rimbik to Darjeeling: 4 hrs. 76 kms. 160 Rps. Sub-Total (3/31-4/4): 20.5 hours in transit to cover 155 kms (96 miles) over 5 days for 1,720 Rps ($31.85 USD). Grand Total (3/3-4/4): I’ll leave out the hiking part as it really throws off everything, so with just the jeep rides, 147 hours in transit to cover 6,712 kms (4,160 miles) over 32 days for 10,937 Rps ($198.85 USD)… or $0.03/km at the warp speed like rate of 46 kmph (28 mph). * My third of the fee for our guide. My guidebook checklists… of the 35 Things Not to Miss in India from my Rough Guide guidebook, I have now seen #’s 3: Kerala Backwaters, 4: Ajanta Caves, 5: Taj Mahal, 9: Khajuraho, 11: Orchha, 15: Kochi, 17: Cricket (in Mumbai), 21: Madurai, 23: Hampi, 24: Ellora Caves, 26: Varanasi and 35: Palolem Beach (Goa). Of Lonley Planet’s Top 20 Experiences I’ve done #’s 1: Taj Mahal, 2: Kerala Backwaters, 3: Varanasi, 4: Darjeeling, 5: Ajanta Caves, 6: Hampi, 7: Riding the Train, 9: Hill Stations, 10: Neighborhood Markets, 11: Goan Beaches, 12: Mumbai’s Architecture, 14: Wandering the Streets, 16: Khajuraho, 20: Delhi. Hi , I am Irma. 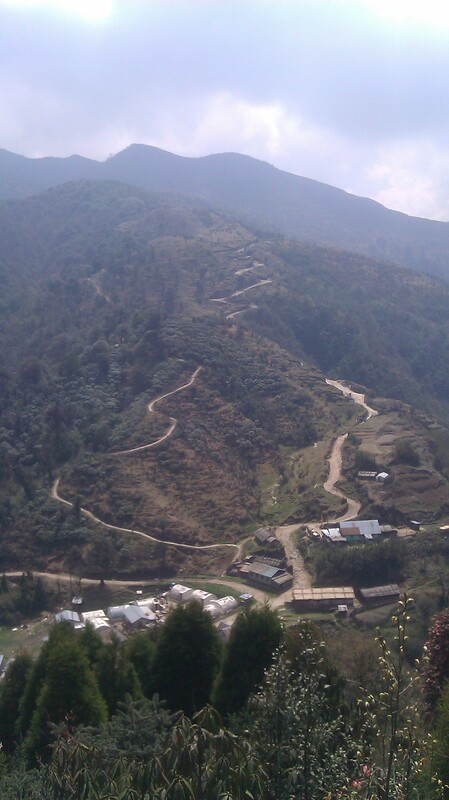 I plan to have Singalila Trek this Nov, just the easy 5-day. 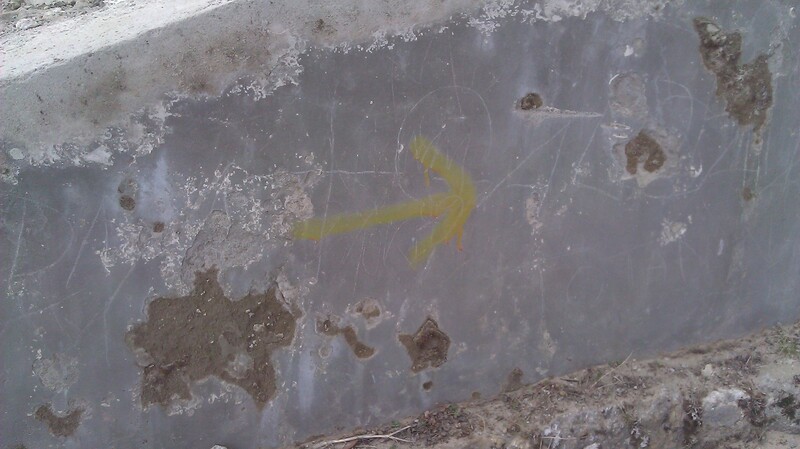 Could you please tell me your guide contact number? I believe that he gave you good service when trekking there. 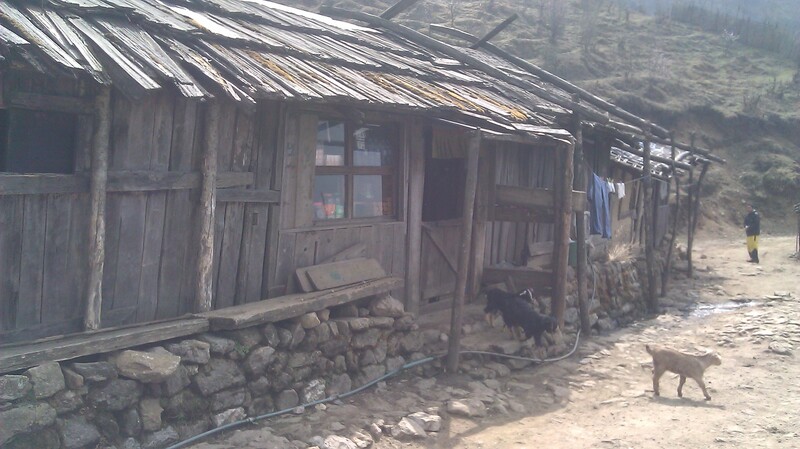 Irma, my guide’s name was Tshering Sherpa. I don’t have his number. 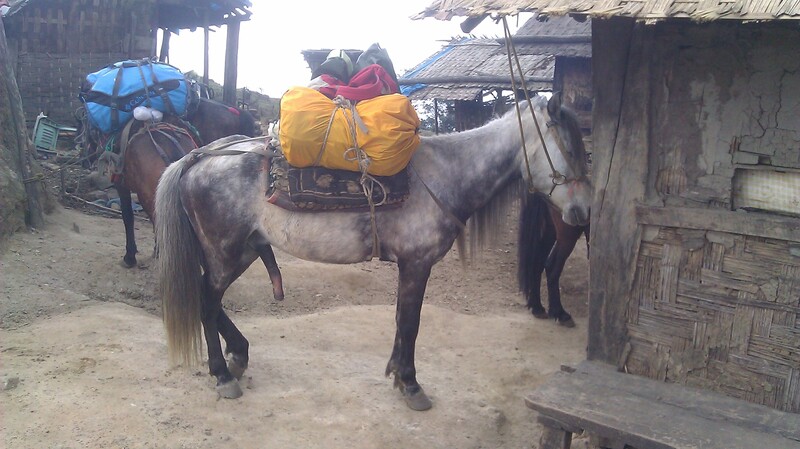 The guide association assigns guides based on a waiting system, so I think you just get the one who is next in line… but maybe you can ask for Tshering? He did do a good job. Hopefully that helps.